Battery, Lithium-ion battery, 2550 mAh. Compatible with WT4090 Standard part BTRY-WT40IAB0E. Battery, Lithium-ion battery, 4800 mAh. Compatible with WT4090 Extended part BTRY-WT40IAB0H. Battery, Lithium-ion battery, 2600 mAh. Compatible with WS1000 part 20-16228-09. Battery, Lithium-Ion battery: 4400 mAh. Compatible with Psion Teklogix: Workabout Pro - Extended. OEM (Part# WA3010). Battery, Lithium-Ion battery: 4800 mAh. Compatible with Psion Teklogix: Workabout Pro. Battery, Lithium-ion battery, 5200 mAh. Compatible with Talkman T5 part Bluetooth-700-1. Battery, Lithium-ion battery, 3900 mAh. 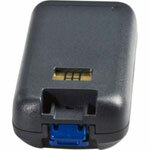 Compatible with Talkman T2 / T2X part Bluetooth-602-1. Battery, Lithium-ion battery, 5200 mAh. Compatible with QL420 part AT16293-1. Battery, Lithium-ion battery, 2550 mAh. Compatible with QL220 / QL320 part AT16004-1. Battery, Lithium-ion battery, 2600 mAh. Compatible with MX9 part 161888-0001, MX9380BATTERY, MX9382BATTERY. Battery, Lithium-ion battery, 3600 mAh. Compatible with MX8 part MX8A380BATT. Battery, Lithium-ion battery, 2600 mAh. Compatible with MX3 part MX3A378BATT, MX3A380RFIDBATT. Battery, NiMH battery, 2500 mAh. Compatible with MX2 part 00-864-00, 5-2043, 5-2389, 990004-0002. Battery, NiMH battery, 1650 mAh. Compatible with MX1 part 153521-0004. Battery, Lithium-ion battery, 1500 mAh. Compatible with MC9000 Short part BTRY-MC90SAB00. Battery, Lithium-ion battery, 2600 mAh. Compatible with MC9000/MC9190 part KT21-61261-01. Battery, Lithium-ion battery, 1900 mAh. Compatible with MC70 / MC75 Standard part BTRY-MC70EAB00. Battery, Lithium-ion battery, 4800 mAh. Compatible with MC70 / MC75 2.5X part BTRY-MC7XEAB02. Battery, Lithium-ion battery, 3800 mAh. Compatible with MC70 / MC75 1.5X part BTRY-MC7XEAB00. Battery, Lithium-ion battery, 3600 mAh. Compatible with MC55 / MC65 / MC67 part BTRY-MC55EAB02. Battery, Lithium-ion battery, 3800 mAh. Compatible with MC50 Extended part BTRY-MC50EAB02. Battery, Lithium-ion battery, 1800 mAh. Compatible with MC50 Standard part BTRY-MC50EAB00. Battery, Lithium-ion battery, 2600mAh. Compatible with MX7 part 159904-0001, MX7382BATT, MX7392BATT, MX7394BATT, MX7A380BATT. Battery, Lithium-ion battery, 3900 mAh. Compatible with CN50 part 318-039-001. Battery, Lithium-ion battery, 4000 mAh. Compatible with CN3/ CN4 part 318-016-002. Battery, Lithium-ion battery, 2550 mAh. Compatible with CK60 / CK61 part 318-015-002. Battery, Lithium-ion battery, 2550 mAh. Compatible with CK30 / CK31 part 318-020-001. Battery, Lithium-ion battery, 2000 mAh. Compatible with CK3 Standard part 318-033-001. Battery, Lithium-ion battery, 5100 mAh. Compatible with CK3 Extended part 318-034-001.